I found a fun new website that gives a weekly theme called shutterday. This week's theme is play... basically what you think about when your at work. I actually have an amazing view out of my window at work of a beautiful lake with hawks and eagles soaring overhead, but I still dream of the beach. 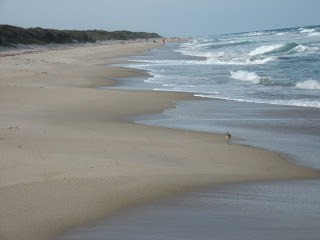 This photo was taken at the Cape Canaveral National Seashore. I love the beach and would go every weekend if my hubby would agree. I think Cape Canaveral is the most beautiful beach! I love the natural state of it! Your photo is beautiful. I loved going there this time of the year. Lovely waves! I;ve been that beach once when we visited Cape Canaveral. You are so lucky to be there all the time! I'm more of a lake person than a beach person so I am envious that you have a view of a lake from your window. I do like your beach photo though. It is very nice.